In the past 4 years I have done a lot of question answering and explaining how triggers work. I think it’s a good time to post some of the answers and talk about the function of the M-K Triggers. Other topics I will cover are the definition of the terms used when talking about M-K triggers and the difference between a single stage and a 2 stage trigger. 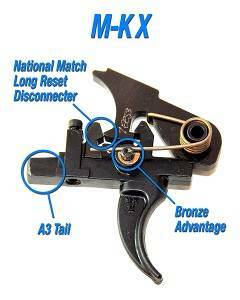 Lastly I will do my best to explain why the M-K triggers are superior to the other triggers on the market. This will be a several part post as I think about what is valuable information for home builders and match shooters. 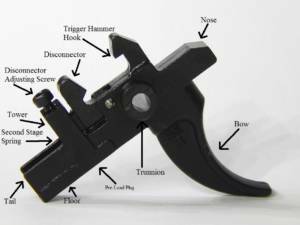 The best place to start is with naming the parts of a Wisconsin Trigger Company M-K trigger and some notes on what they do. Nose. The nose is part of the safety features. It stops the hammer from moving at the wrong time. Bow. The bow is the part that sticks out from the bottom of your rifle. Trigger Hammer Hook. This is where the hammer and trigger meet. When you pull back on the Bow, the trigger will pivot at the trunnion on the trigger pin. When it pivots, the Trigger’s Hammer Hook will move away from the Hammer’s Trigger Hook. The two hooks will part. When they no longer overlap, the hammer will be released and the gun makes a big noise. Hammer Trigger Hook. The opposing hook to the Trigger hammer hook. Trunnion. This is where the Trigger Pin goes and is the pivoting point of the trigger. Disconnector. The Disconnector is responsible for holding the hammer back when the trigger has been pulled back to the start of second stage. Disconnector Adjusting Screw. This is how the Disconnector is adjusted to remove 100% of trigger creep. More on that later. Pre-Load Plug. 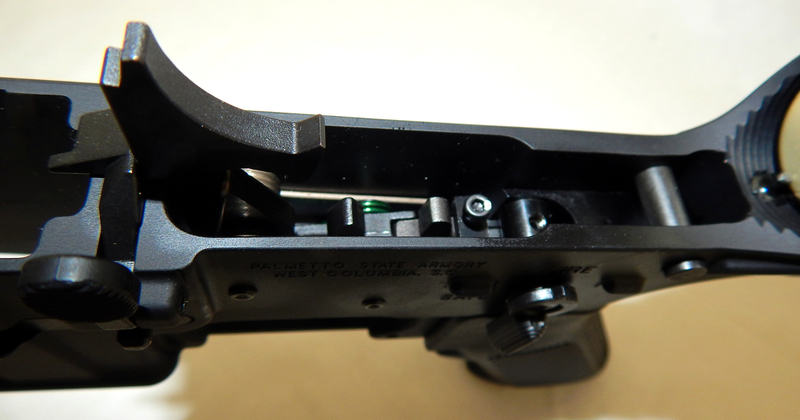 This part is installed in a threaded hole in the bottom of the trigger housing. It is directly beneath the Second Stage Spring. The plug is removed to install the Second Stage Spring. It is also used to fine tune the second stage pull weight. Turning the screw in will increase the second stage pull weight and turning it out will decrease it. Tower. The Tower is cast with the trigger body and holds the Disconnector Adjusting Screw and the Second Stage Spring. Floor. The Floor is the bottom of the trigger housing. Tail. The Tail is the walls on the side of the trigger housing. On the M-K IIA1 and M-K IIA2 models the tail sets the over travel. More on over travel will be covered in a future post. Second Stage Spring. This spring is the main factor in setting the second stage pull weight. The Second Stage Spring is found inside the Tower and is installed through the Pre-Load Plug hole. Sleeve. The sleeve is pressed in to the hammer body. The Sleeve holds the hammer pin retaining clip and when the hammer is installed in the lower receiver, the hammer pin goes through it. Hammer Body. The Hammer Body is the male part and has a hole for the Sleeve to fit in. Strike Face. 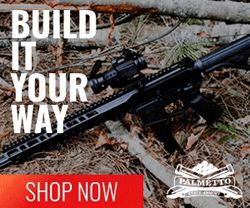 The Strike Face is the part of the hammer that hits the firing pin in the BCG. Second Stage Hook. 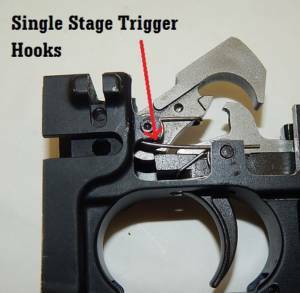 This hook contacts the Disconnector to reset the trigger after firing and to hold second stage. Hammer Trigger Hook. See part 3 in the trigger list above. Hammer Pin Retaining Clip. The Clip is found inside the Sleeve. Here are some of the terms used when talking about triggers. You may have heard of some of these but they may not have been explained clearly or they may have been used in in a different context. You may want to go back and forth to the diagram of the parts. I will be adding to this list as we discuss trigger components and their operation. M-K Trigger. The trigger system built by the Wisconsin Trigger Company. First stage. Starts with the trigger at rest and ends at the Wall. The Wall. The point that first stage ends and second stage begins. The shooter can feel the Disconnector holding back the hammer. 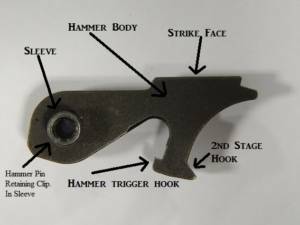 Hammer’s Trigger Hook. The Hook found on the Hammer that links to the Trigger. Trigger’s Hammer Hook. The Hook on the Trigger that links to the Hammer. Second Stage. Starts at the Wall, The Disconnector holding the Hammer back. Separation. The two Hooks moving apart. Disconnector. Holds the Hammer back. Second Stage Spring. Provides the pressure for the Disconnector to hold back the Hammer. Trigger. Holds all the parts that determine when the hammer will be released. Hammer. Held back by the Trigger and when released strikes the Firing pin. Safety Selector. Determines whether or not the hammer will be released. Also the stop for the over travel. Overlap. When the two Hooks are touching each other. Pull. Moving the Trigger rearward to release the Hammer. Reset. Letting the Trigger move forward to start First Stage again after the Hammer has been released. 2 Stage Trigger. A Trigger with a First and Second Stage. Single Stage Trigger. A trigger without a Second Stage. Grit. The feel of a poor surface finish on the Hooks. Trigger Creep. The distance a Trigger will move after the Wall is reached. Pull weight. How much pressure it takes to separate the Hooks. Lock time. The time from the release of the hammer to the striking of the Firing Pin. Overtravel. The distance the Trigger moves after the Hammer is released. Firing Pin. Found in the Bolt. When struck by the Hammer it hits in to the cartridge primer. Divorced Disconnector. The Disconnector is mounted on its own pin. Married Disconnector. The Disconnector is mounted on the Trigger Pin. In Part 2 we will start to cover the difference between a two stage trigger and a single stage trigger, along with how to spot a true match / target trigger for the AR-15 rifle. One point I wanted to clear up. The hooks on a single stage trigger are found in the nose. They are more of a hook and slot. Please see the photos. About the author. Ron Albanese is the owner of The Wisconsin Trigger Company. 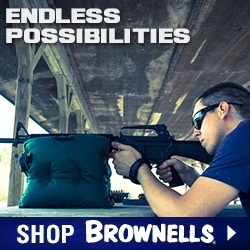 Ron has over 30 years experience in the firearms industry. 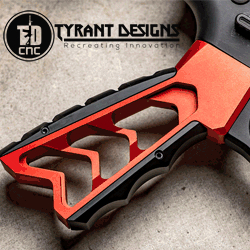 His company produces the M-K series of AR-15 triggers. Ron is proud to offer these triggers. 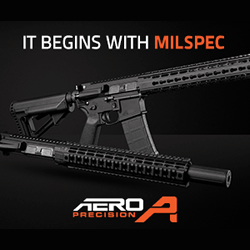 From the first 2 stage trigger ever fit into an AR-15, the M-K II in the late 1980’s to the latest world record setting and National Match winning M-K X trigger, the M-K series triggers are an outstanding choice for AR-15s.